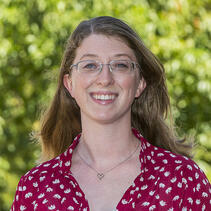 Rachael Keeler serves San Diego Zoo Global as a Senior Research Associate in Disease Investigations. 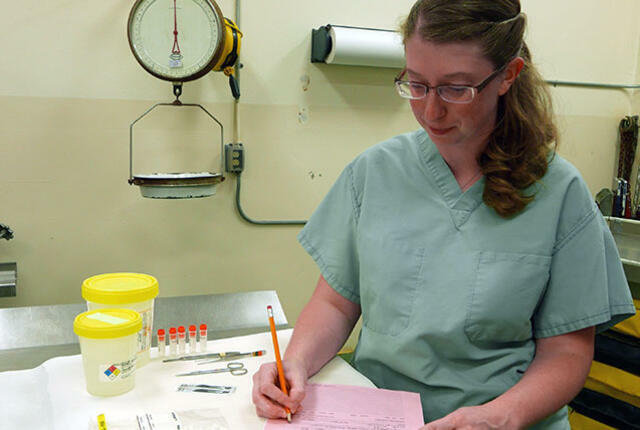 She is part of a team that conducts post-mortem necropsy examinations on animals from the San Diego Zoo, Safari Park, and other conservation projects. 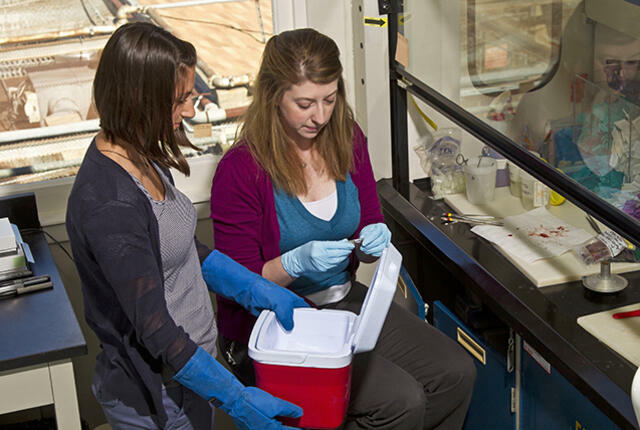 She is responsible for trimming in tissues for histologic examination, and helps manage the paraffin blocks and slides in our museum-accredited Pathology Archive, representing thousands of cases. Since becoming part of the Disease Investigations team, Rachael has found that her work aligns with her interest in wildlife conservation and preservation. 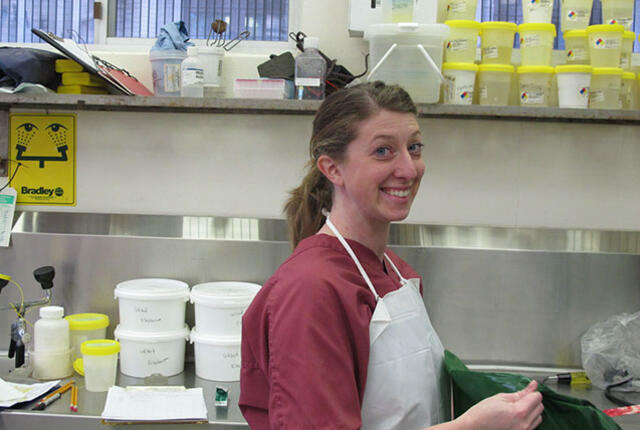 Rachael is responsible for keeping the logs and monitoring all samples sent for avian mycobacteriosis testing. She conducts orientations for our Veterinary Externs in Pathology and monitors their progress as they improve their necropsy skills. Rachael enjoys writing blogs and giving presentations on interesting anatomical features of animals seen in necropsy. She attends conferences and workshops with other mentors in the field of wildlife conservation, including the C.L. 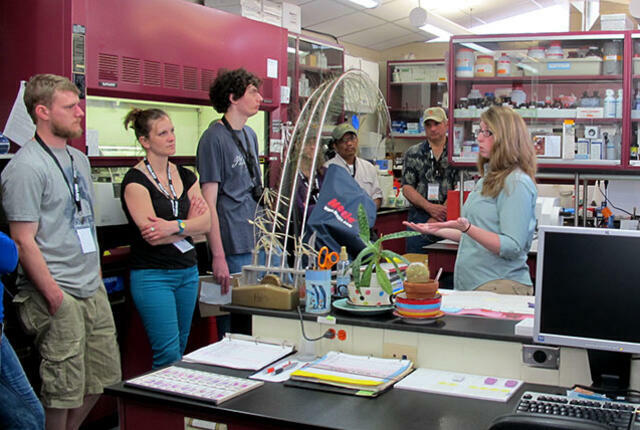 Davis Forensic Pathology workshop and the Association of Zoos and Aquariums’ annual conference. Rachel earned her bachelor’s degree in Marine Biology from University of New England, where she conducted her first necropsy while working at a marine wildlife rehabilitation center. Disease investigation has been a strong interest of hers ever since. Rachael was born and raised in San Diego, and continues to volunteer in the field at a marine mammal rehabilitation center in Orange County.